Tommy Daly Chairperson of the Moyross Residents Alliance is sick of the Limerick Regeneration with their promises, hiring contractors which are doing flawed work which endangers our kids, we are sick of our kids being discriminated here in Delmege Park, we have included images of a girl who has fallen and obtained a nasty gash on the knee from the uneven pavement work, which was left by Airtricity contractors. We are also experiencing a huge flood outside our community garden, which has been accumulating the last six weeks due to high rainfall and this is because of the blocked drains which the cement has now settled inside, after the contractors completed their job, our kids have to walk around this pool of water which delays time which should not be an issue to begin with. We reported this to Micheal O' Kelly before Christmas and it was promised that this would be fixed and drains repaired as soon as it was possible, which was now 6 weeks ago, we call on them to get off their arses and sort out this problem before someone else gets hurt or in a worst case, infection from playing in the dirty water that is connected to the main drainage system of limerick. They would want to get off their backsides and get these issues sorted out immediately, this is a health hazard and our kids need to play in a safe environment, not a dirty swimming pool outside their doors, Tom Daly Chairperson of the Moyross Residents Alliance. 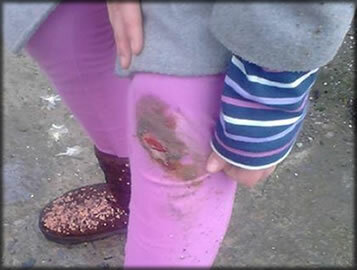 Eight your old girl gets a right gash on her leg after tripping on the footpath outside the St.Francis community garden, again bad workmanship done by contractors employed by Airtricity and Limerick Regeneration, "It's a disgrace" said Tom Daly, Chairperson of the MRA, "We now have a swimming pool thanks to the same company who done the work, the bad workmanship, the people of Delmege Park are sick of this, this degrading of our residents of Delmege, we have rights like any other people you can be sure it would not happen in Caherdavin or any other areas of Limerick. The Moyross residents alliance has photos of all these incidents that is happening, now I will say fair play to Micheal O'Kelly, he told us that he would have a new path put down and that he would get the drains cleared, in which the concrete went down into, blocking them up once the workers were finished, which is a disgrace, we want this problem sorted out immediately afterall these people thats doing this work should be concentrating on what they are doing and keeping health and safety in mind and also our enviroment. Tom Daly Chairperson of the Moyross Residents Alliance.